I have typed the Bible quotation into the cells of the Game of Life. I have processed the result of the generated life of cells which represnt the truth of the world as an infinite video which alternates in running forwards and backwards to correspond with the content of the text. The viewer has the opportunity to watch creation and demise in any given moment and for any duration. The game made Conway instantly famous, but it also opened up a whole new field of mathematical research, the field of cellular automata ... Because of Life's analogies with the rise, fall and alterations of a society of living organisms, it belongs to a growing class of what are called "simulation games" (games that resemble real life processes). 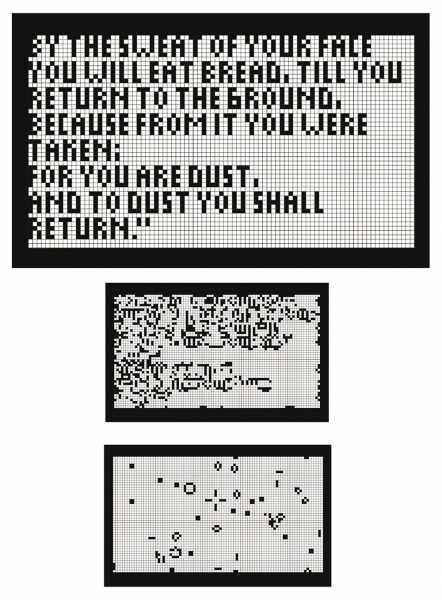 Ever since its publication, Conway's Game of Life has attracted much interest, because of the surprising ways in which the patterns can evolve. Life provides an example of emergence and self-organization. It is interesting for com- puter scientists, physicists, biologists, biochemists, economists, mathematicians, philosophers, generative scientists and others to observe the way that complex patterns can emerge from the implementation of very simple rules. The game can also serve as a didactic analogy, used to convey the somewhat counter-intuitive notion that "design" and "organization" can spontaneously emerge in the absence of a designer. For example, philosopher and cognitive scientist Daniel Dennett has used the analogue of Conway's Life "universe" extensively to illustrate the possible evolution of complex philosophical constructs, such as consciousness and free will, from the relatively simple set of deterministic physical laws governing our own universe. There should exist small initial patterns with chaotic, unpredictable outcomes. There should be potential for von Neumann universal constructors. ... The rules should be as simple as possible, whilst adhering to the above constraints. Any live cell with fewer than two live neighbours dies, as if caused by under-population. Any live cell with two or three live neighbours lives on to the next generation. Biblický citát som “vyťukal” do buniek Hry Života. Výsledok generovaného života buniek obsahujúcich pravdu sveta som spracoval ako nekonečné video pustené striedavo od predu a od zadu tak, aby korešpondovalo s obsahom textu. Divák má možnosť v akomkoľvek momente a akokoľvek dlho sledovať vznik a zánik. Hra života nebo také život (anglicky Game of Life či pouze Life) je dvoustavový, dvourozměrný celulární automat, který svým chováním připomíná vývoj společenství živých organismů. Odehrává se na matici buněk, jejíž stav předurčuje podobu hry v následujícím kroku. Uživatel pouze určí výchozí konfiguraci a dále již hra běží automaticky podle předem daných pravidel. Čas je ve hře diskrétní, při každém uplatnění pravidel se posune o jednotku. Hra života se od podobných celulárních automatů liší v pravidlech pro zrod nových buněk a jejich přežití. Kořeny hry života sahají do roku 1940, kdy maďarský matematik John von Neumann přišel s konceptem celulárních automatů. Hru života jako takovou však vymyslel až britský matematik John Horton Conway v roce 1970. V průběhu hry vznikají různé tvary, které se dělí do kategorií jako jsou zátiší, oscilátory, děla a další. Hra života je příkladem systému, kde z jednoduchých pravidel vzniká komplexní chování - objevují se zde tzv. emergentní struktury. ... Každá živá buňka s méně než dvěma živými sousedy zemře. Každá živá buňka se dvěma nebo třemi živými sousedy zůstává žít. Každá živá buňka s více než třemi živými sousedy zemře. Každá mrtvá buňka s právě třemi živými sousedy oživne.